NASA: Earth just experienced the warmest six-month stretch ever recorded. It seems all our efforts to bake the planet are finally paying off. Our planet is on a hot streak. Over the weekend, NASA announced that last month was the warmest September since global records have been kept. What’s more, the last six months were collectively the warmest middle half of the year in NASA’s records—dating back to 1880. The record-breaking burst of warmth was kicked off by an exceptionally warm April—the first month in at least 800,000 years that atmospheric carbon dioxide reached 400 parts per million. According to the National Climatic Data Center, which keeps a separate record of global temperatures, this April ranked as the warmest April on record. Followed by the warmest May on record. Followed by warmest June on record. (July wasn’t quite as hot—just the fourth-warmest July on record.) But August—again, you guessed it—was the warmest August on record. The NCDC will release its numbers for September later this month. As I wrote last November, a trend toward El Niño may be helping to spark a massive heat release from the tropical Pacific Ocean, boosting 2014 into front-runner position for the hottest year ever measured—a phenomenon that may stretch into 2015 as well. Recent research shows the current warm stretch is probably the planet’s warmest in at least 4,000 years. That means global temperatures may have already passed a level that human civilization has never experienced. The sheer size and depth of the world’s oceans means that most of global warming’s extra heat has been stored there. For the last decade or so, atmospheric warming has been playing catch up. If the last six months are any indication, the pace of atmospheric warming may finally be picking up. Update, Oct. 14, 10:15 a.m.: On Tuesday​, Japan’s Meteorological Agency confirmed that last month was indeed the warmest September ever measured. (JMA’s global instrument records date back to 1891.) According to JMA, every September in the 21st century has been above the long term increasing trend, a sign of accelerating warming. 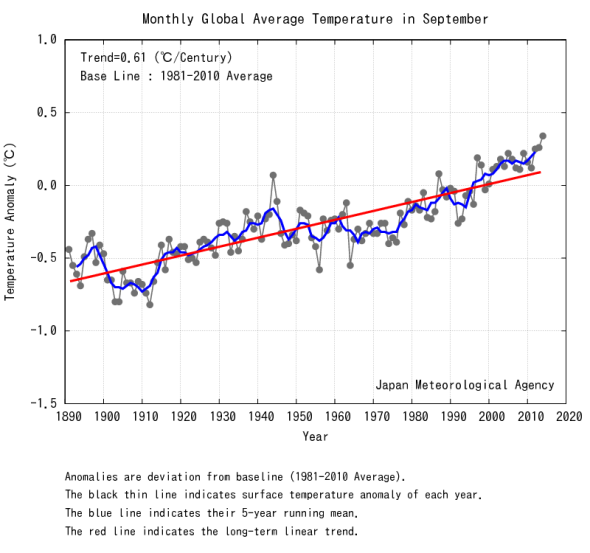 Japan’s Meteorological Agency has also ranked last month as the warmest September on record.